For my first TechRadar Pro article, I thought it would be appropriate to look forward, towards the future and a piece of tech that's soon to be coming down the line. Over the years I've spent a lot of time focusing on helping people with productivity. Whether it's at talks and events, in videos or through other mediums, such as this article, productivity is at the core of what we all need to get out of our PCs, and it's for this reason that the next version of Windows (codenamed Threshold) is getting me very excited. I've written a lot about Windows over the last few years: how to get started with it, how to customise it and exploit its hidden functionality, and how to repair problems if everything goes horribly wrong. I'm in contact almost every day with people who have used Windows for work, study or play for years now, but still I encounter many who struggle to make the most productive use of their time. 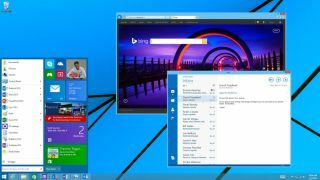 Part of the problem is the complexity of an operating system the size of Windows, and more problems arise because of Windows' need to be something for everyone. Windows 8 was an interesting step in a new direction (though it didn't go without a few hiccups) and Windows 8.1 has refined the idea further. However, with Threshold – bearing in mind we don't know the full story concerning this OS yet, by any means – it looks like Microsoft has put the entire focus on productivity, and Redmond's engineering teams are working on nothing but. There also looks to be something for everybody, from programmers able to save valuable time by having a unified code base for Windows Phone, Modern apps, Xbox and, perhaps, even the desktop, with apps that can scale and change dynamically to fit the device you're using, to talk of major productivity enhancements for desktop Windows users (who felt a little left out last time around). When I give talks I regularly extol the virtues of features such as Workplace Join, Work Folders and Windows To Go, just a few of the plethora of productivity features that Windows 8 and Windows Phone 8 introduced. Not to mention enhanced multi-screen desktop support, Miracast, mobile tethering, Powershell 4, Wi-Fi direct and NFC pairing, InstantGo, gesture control and everything else that makes up the productivity enhancement package. With a renewed focus on the desktop, and how we use it day to day, it's looking like Threshold will be the Windows release that I personally have been expecting for many years now. So what do I know that's got me all excited? In truth, not a huge amount, but there are nuggets in all the right places. It's long frustrated me that so many aspects of the Windows UI date back to early versions of NT, especially the Control and Management functions. The introduction of Windows Server 2012 with its "live tile" interface shows the way forward, and what can be done with the expected overhaul of all these systems. Without a doubt, I am very excited about the features that Threshold can deliver in terms of helping everybody from developers, through system administrators, to end users get done what they need to do in less time than it's taken before. After all, this is what progress is all about, right?